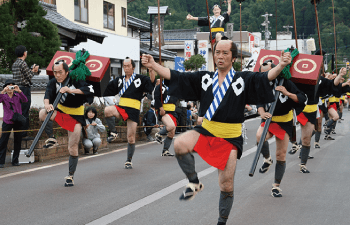 There are a handful of events coming up in Izushi for the autumn season! The opening event of the Eirakukan Theatre was performed by a kabuki star Ainosuke Kataoka in 2008. Since then, Kabuki plays are performed by this actor, now one of west Japan’s leading kabuki actors, and his theatre company. Location: Izushi-cho, Uchi-machi, Izushi Castle Ruins, etc. 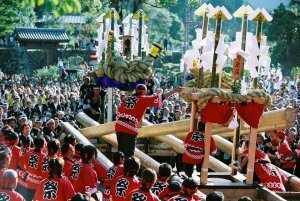 We consider wearing kimono, the traditional Japanese cloth, as a long-term sightseeing feature of Izushi. There will be events to encourage wearing kimono at the soba noodle festival, street-shops, rental kimono shops, a kimono-wearer’s raffle, historical costume performances, a mystery solving tour, and other events. 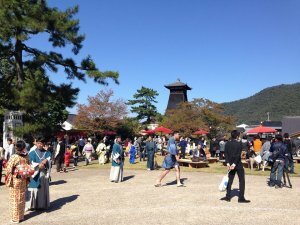 On the 3rd of November every year, the Castle Festival is held to symbolize the castle town of Izushi. The main attraction of the day is the marching of about 120 people all dressed in traditional costumes, with 30 men holding decorated spears as they walk along the streets.